Iran’s Mid East commander Gen. Qassem Soleimani has devised a plot to force US troops not just to leave Syria but to be thrown out of US bases in Iraq as well, DEBKAfile’s military and intelligence sources report. Iraqi Shiite militias have been assigned to carry out terrorist attacks on the US troops scheduled to leave Syria. A US or Israel military reprisal in Iraq will, according to Soleimani’s plan, provoke Baghdad into ordering the US forces to leave their Iraqi bases forthwith. The concentration on the Iraqi border of 10,000 troops belonging to the large pro-Iranian Iraqi Popular Mobilization Units (PMU) aka as the Hashd Al-Shaabi militia (first reported by DEBKAfile on Jan. 17) is stage one of Soleimani’s military track. Revealed here for the first time by our sources is Soleimani’s latest project in Syria. He has sent his officers to set up liaison hubs for the Iraqi PMU militiamen to coordinate militarily with the Arab tribes of eastern Syria. It is believed that their tasks will focus on engineering terrorist operations against the US troops heading out of Syria. Informed intelligence sources strongly suspect that the huge suicide bombing in the northern Syrian town of Manbij last Wednesday, which claimed 5 American lives and killed another 11 Syrian Democratic Forces (SDF) fighters, was the first of these attacks to be carried out on Soleimani’s orders by one of those joint squads. Tehran is also going to great trouble and expense to plant imported Shiite communities in the Syrian villages and townships located along the Damascus-Beirut highway and partly depopulated during the civil war. Some of these Shiite communities come from Iraq; others are the families of Afghan and Pakistani Shiite militias recruited by Tehran to fight for Bashar Assad in the civil war. These militiamen, whose families awaited their return in refugee camps in Iran, are being demobilized and allowed to bring their families over to rejoin them in Syria. According to some estimates, Tehran has been able to swell Syria’s Shiite population by some 9,000 imported families, all of them serving yet another of Iran’s objectives in Syria: the creation of a Shiite Corridor between Damascus and Beirut. Iran has already lost. They are loathed throughout the Arab world, so much so that Arab states are aligning with Israel to defeat them. Iran has been suffering a countrywide drought years, and the underground water they are pumping is causing earthquakes and sinking infrastructure. The Iranian economy is on the brink of total collapse, the people are taking to the streets, and the only thing keeping the Ayatollah in power is the brute force of his militias. Eventually this house of cards will collapse, and likely in the near future. Rumi- Iran does have several problems. Maybe we infidels are not as tuned in as you. They are loathed by Sunni Arabs, but not Shia Arabs. And there is a belt of Shia Arabs running around the western end of the Gulf and east along the southern shore to Bahrain. That’s in addition to the belt running west through Iraq, Kuwait, Syria and Lebanon. The rest of your comments are equally wrong and based on Israeli disinformation. One hopes the Israeli government does believe its own propaganda, because they need clear heads when dealing with Iran. What you are saying has been seen to be correct but like Venezuela, as long as the army and the elite revolutionary forces stay with the ayatollas they will keep themselves in power. So far, similar to Venezuela rioters have been forcibly supressed. Not only are the Muricans retreating in defeat or shame once more, they will be hunted down like rabid dogs as they run away. Unfortunately not all of the above is factual. Persia is part of the northern Confederacy which attacks Israel at the time of the end which is pretty much now. Influential Zionist historian Benny Morris, professor of the Middle East studies department of the Israeli Ben-Gurion University of the Negev, has foreseen a bleak future for the Zionist establishment. “Already today there are more Arabs than Jews between the [Mediterranean] sea and the Jordan. The whole territory is unavoidably becoming one state with an Arab majority,” said Morris in an interview published by the Israeli Haaretz newspaper on Thursday. Arabs left the land because they were ordered to, and deliberately incited into panic, by their own leaders who wanted the field cleared for the 1948 war of invasion of Israel and complete extermination of Jews. It is all well documented. Their mind was: no Arab there such that they could kill all civilians with no fear of harming an Arab. and if the census numbers are fake (which they are), where does that leave this “influential zionist historian” (not a demographer by the way)? We did it, Israel’s allies with the help of the Mossad. 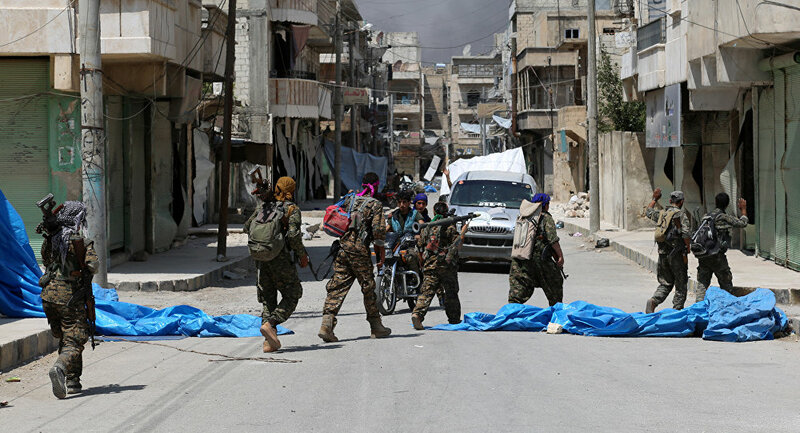 Reports just emerged that the Islamic State terrorist group has claimed responsibility for the attack in Manbij. The suicide attack which was carried out with an explosive belt targeted a Coalition patrol near Umara’ Castle restaurant. Dozens of civilians gathered nearby were killed or injured while pictures depict two US Marines were downed- their fate still unknown. USA Soldiers have killed by turkish intelligence service. Iran has no any effect in north syria. Turks are more dangerous than Persians. If you want to destroy Mullah regime. we have to finish erDOGan s regime. It can be only with support of Kurds. Good idea to recognize EU as a member of UN and open a similar to consulate office in Jerusalem.